growing up, i was always a chocolate person. i have this vivid memory of baking brownies one day and offering one to my next door neighbor scott, only to have him tell me he didn’t like chocolate, he liked vanilla. i’m pretty sure i almost dropped the brownie, i was so shocked. i mean, what kind of person doesn’t like chocolate? was scott an alien? was he trying to pull a fast one on me? turns out, the kid just didn’t like chocolate. last summer, when he got married, there was no chocolate in the cake. he’s all vanilla, all the time. we’re no longer five years old and playing hopscotch on our driveway, and as i’ve aged, i’ve come to appreciate the simplicity of vanilla. vanilla extract is my secret baking weapon. i always add extra to everything i bake, and the results are pretty much always spectacular. i derive great pleasure from gutting vanilla beans and scooping out their fragrant insides. and yes, i even eat (and make) vanilla ice cream. which is what prompted this ice cream escapade, which utilizes recipes from david lebovitz’s the perfect scoop. the man is practically an ice cream god, so rest assured, this recipe is quite good. 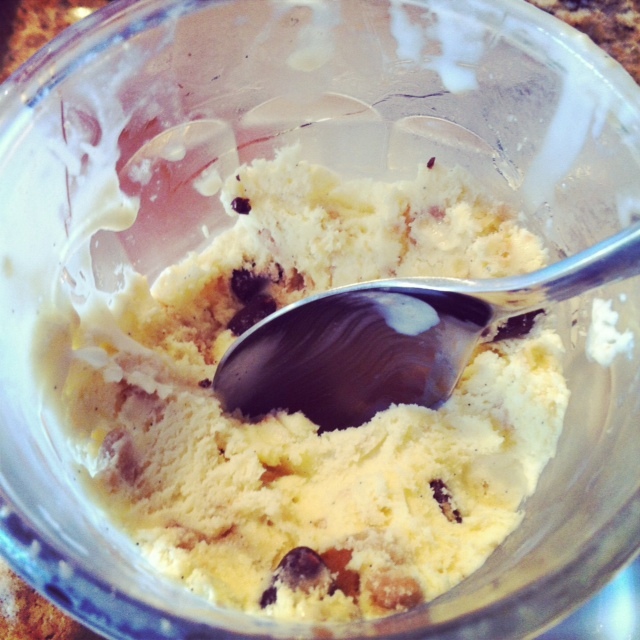 i’d never made cookie dough ice cream before, and so initially, i searched for a cookie dough ice cream recipe. turns out, there’s no real recipe for that. what you’re supposed to do instead is make your favorite vanilla ice cream, and then add special cookie dough (sans eggs) into it at the very end. well, color me educated in the ways of the ice cream elite. i took both the vanilla bean ice cream and the cookie dough recipe from the perfect scoop, though i found an abundance of recipes on google that are probably just as good. the result is ice cream that’s so creamy you swear it’s melting the second you put the spoon to your mouth, and cookie dough that tastes pretty damn close to the real thing (hard to achieve without any eggs, let me tell you). so, shall we? note: you’ll need an ice cream maker for this recipe. i have this one from cuisinart. it was dirt cheap, and works like a charm. to make, warm the milk, sugar, 1 cup of the heavy cream, and salt in a medium saucepan. you don’t want it to boil, per se, so keep the burner somewhat low. scrape the seeds from the vanilla bean into the warm milk, and add the bean in there as well. when the milk is warm, cover, remove from heat, and let steep at room temperature for 30 minutes. go give yourself an at home mani, or watch 1/2 of the latest episode of nashville while you wait. done? good. now, pour the remaining 1 cup of cream into a large bowl and set a mesh strainer on top of it. in a medium bowl (i do this part in my stand mixer), whisk together the egg yolks. slowly pour the warmed vanilla milk mixture into the egg yolks, whisking constantly (this is where the stand mixer comes in handy; you can just set it on low), then scrape the warmed egg/milk mixture back into the saucepan. take care not to dump all your warmed milk into the eggs at once, the last thing you want is for them to cook. stir the egg/milk mixture over medium heat with a heatproof spatula, scraping the bottom as you stir, until the mixture thickens and coats the spatula. in my experience, this takes anywhere from 3-7 minutes. wondering if the mixture is ready? run your finger down the middle of the spatula. if the mixture parts like the dead sea and doesn’t run, it’s ready. not running? congratulations, you’ve just made custard! pour your custard through the strainer and stir it into the cream. put the vanilla bean into the mixture, add the vanilla extract, and put your bowl over an ice bath, stirring until cool. chill the mixture thoroughly in the fridge. usually, this takes about an hour or two. that’s enough time for two episodes of chicago fire or one episode of the voice’s blind auditions. there’s really no bad option – you either get hot firefighters or two hours of blake shelton wearing the hell out of a really great vest. …which you can make by following the instructions below. to make, stir butter and sugar together in a medium sized mixing bowl until smooth. stir in the flour, then the vanilla and chocolate chips. form the dough into a 1/2″ thick disk, wrap it in plastic wrap and refrigerate until firm. once chilled, unwrap the dough, and chop it into bite size pieces. and there you have it, folks. now, go forth and make ice cream.